The summer, Boston is having an entertainment series filled with "music, movies, & more!" 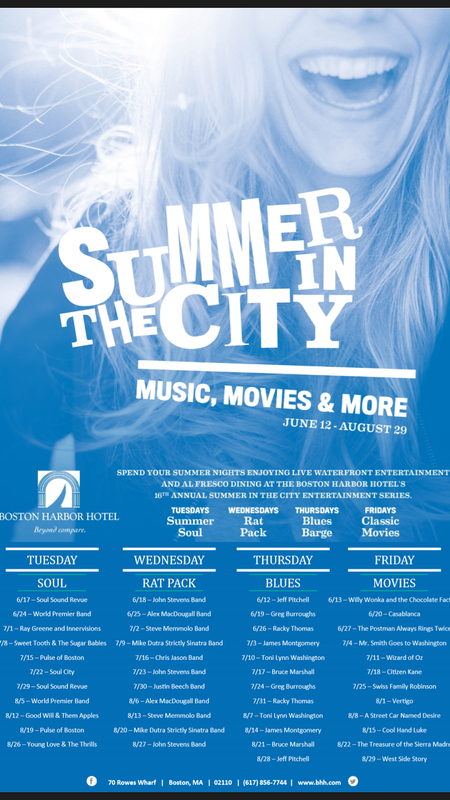 Hosted by the Boston Harbor Hotel, Summer in the City takes place right on the waterfront along Rowes Wharf. Not a bad location, huh? ... and we were joined by one of my roomies for next year! Unfortunately, we didn't have very good seats. You might be able to see how weird our viewing angle was? Add the sounds of the ocean and people having dinner to the equation, and we couldn't hear all that well, either. SO. Logically, we packed up and went for cupcakes! and into the Her Campus pink storefront of Lulu's! Everything is homemade and delish! Just walking into the store made my mouth water. For example and to show exactly how awesome the store smelled, know that Aja un-vegan-ed for the night to enjoy a cupcake! I wish I could have taken this chandelier home with me- it would look great in my new bedroom, don't you think? I love that my fellow interns are so easy to hang out with! This summer would be so much less enjoyable if they weren't as cool as they are. #HCXO in your general directions, ladies!